The fault lies in a recent update to 'TouchPal Keyboard for HTC,' also referred to as 'TouchPal Sense Edition,' which HTC has included as the default keyboard on a wide variety of phones. It's even bundled on the company's latest flagships, including the HTC 10 and U11. 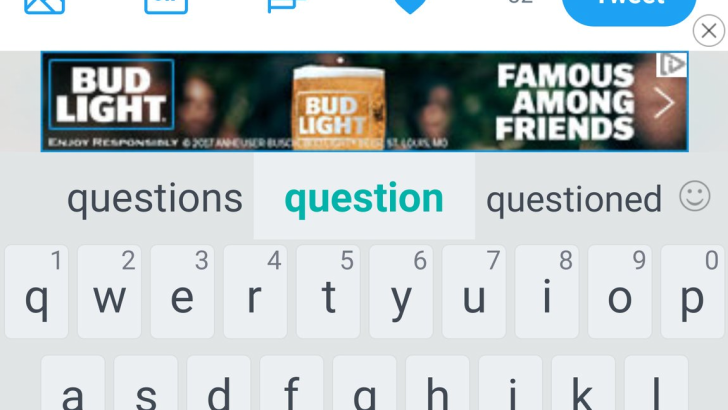 Understandably, people are not happy at all about ads on their keyboard. In response to the complaints, the official HTC Twitter account is asking users to uninstall all updates to the keyboard app. But as I'm sure many of you can guess, this is just a stopgap measure until the keyboard updates through the Play Store again. Pls.go to Settings>Apps>All apps>Look for the app (TouchPal)>Uninstall updates. For assistance please go to https://t.co/etXmQQWcjL. Judging from HTC's response, it seems likely that TouchPal added advertisements to the keyboard without HTC's knowledge/approval. The app listing in question is published by TouchPad, after all. But both companies are definitely at fault here; HTC shouldn't let another company control such a vital component of its products. I was able to easily turn the ads off, however. No need to install a different keyboard. In the touchpal general settings, there is an option called "keyboard recommends". The TouchPal keyboard also has a new $5/year subscription that enables new features and disables ads. But I'm not really sure who would pay to remove ads on a keyboard.